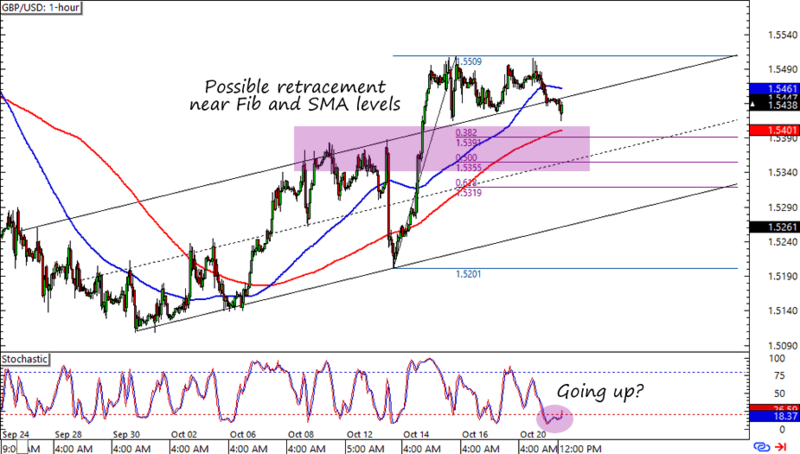 Forex Trade Idea: Time for a Cable Retracement? Found a neat forex setup for the pound bulls! Are you also watching this potential trend retracement on Cable’s one-hour time frame? As you can see on the chart below, GBP/USD is dipping below its weekly support near the 1.5450 area. What makes this setup interesting is that it could head for the 1.5400 zone, which is right smack at a resistance area back when the pair was contained in a rising channel. Are we about to see a resistance-turned-support scenario? Throwing in the Fib levels reveals that the area is also near the 38.2% – 50% Fibs as well as the 200 SMA zones. If the pair does dip to the 1.5400 – 1.5350 area and you think that the pair is headed higher, then a stop just below the previous mid-channel line and the Fib areas could get us pips, especially if we target previous highs or even mid-September’s highs at 1.5650. Fundamentally I don’t really have a strong bias on the pound’s future direction. One look at the calendar though, tells us that there are barely any major U.S. reports on tap this week, which decreases the possibility of traders changing their short bias on the dollar. On the pound’s side, this week’s speech by BOE Governor Mark Carney and U.K. retail sales report could push the currency in either direction. I know that Mark Carney has been hawkish in his last speeches and market players are currently expecting stronger-than-last-month retail sales readings. If both events turn out in favor of the pound, then we just might see an extension of the pound’s uptrend. What do you think? Is GBP/USD in for more gains or are the bulls done with their run?